Every sequined place in the world has another side to it, but the glitter is often so blinding that we can’t see it. 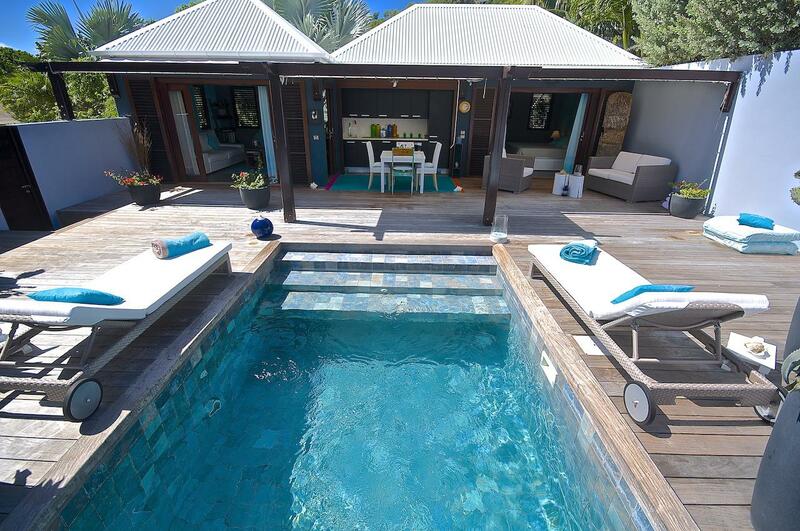 Case in point: St. Barth. Models, moguls, celebrities, yachts, private jets, the Villa Rockstar at the Eden Rock – St Barths Hotel (23,000 Euro per night mid-January to mid-April), shelter-magazine ready villas, rosé-romping afternoons at Nikki Beach: That’s the island’s matchbook-cover resumé. Oh yes, and rich people doing silly things because money is no object. One year Elon Musk shipped his Tesla in, even though he was warned that the car was too low slung for the roads. And all this is true—for part of the year. Starting around December 20, this cast of characters mostly arrives on private jets or in business class in St. Maarten and then comes across on a puddle jumper: The short runway (1,850 usable feet) imposes egalitarianism in the end—and the landing has birthed a genre of You Tube videos. It’s a landing to remember. But there is another St. Barth and early last December The Hotel Detective set out to find it with the help of Sibarth, the island’s largest and oldest villa-rental agency (www.sibarth.com). The brief was simple: No Westminster Dog Show villas such as the agency’s Villa Nirvana at $2,000 per night per bedroom. THD wanted simple nirvana: one- or two-bedroom, modest price, beachfront not necessary. Don’t show me the money. He was surprised by just how many properties there are on the island in this category. THD went just before high-season rates kicked in—on December 15 hotel rates double and Sibarth’s rates do as well. But from December 1 to 14, you can get high-season weather and low-season prices. But this brings THD to the real point: St. Barth is one of the Caribbean’s great overlooked summer destinations. Hotel and villa prices drop around April 15. The island gets pleasantly drowsy. People who own villas come back to use them. You don’t have to have a muscular concierge to get a table at Maya’s, L’Isola, or Bonito, three of the island’s best places to dine. And it’s not as hot as you think. The average high and low in July and August is 86F and 77F. In New York, it’s 83F and 68F in July and 81F and 66F in August, and Chicago is about the same. Not much difference except that in St. Barth you’re wearing a bathing suit, not a business suit. So here’s THD’s police-artist sketch of the three villas that Sibarth offered that fit the bill. 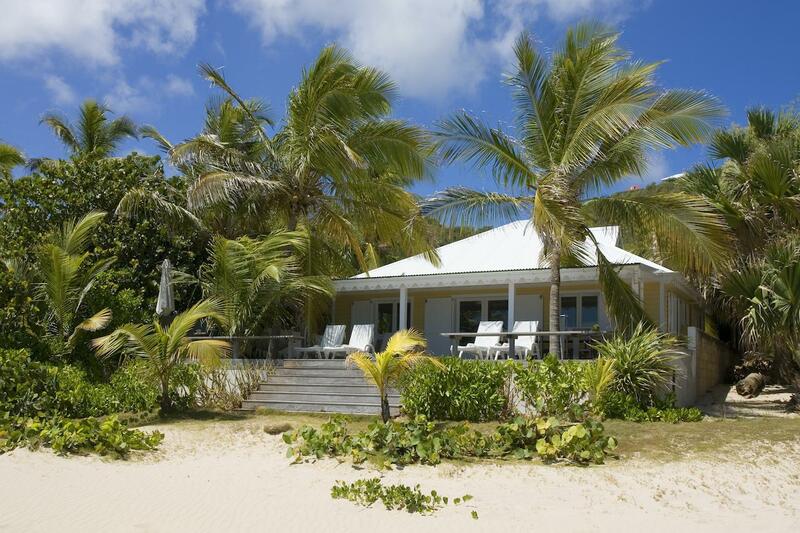 Ti Reve: The name means “little dream” and it was, a homey compound off the main road in Grand Cul de Sac (and near one of my favorite beach-shack restaurants, O’ Corail). The house is L-shaped (living room, bathroom, bedroom, in that order), but it was the large outside kitchen, deck, and plunge pool (below; photo by Axelle Capelli) that made Ti Reve a good retreat in the afternoon. THD had Sibarth book a chef to make dinner the first night and recommends the splurge. Sibarth will stock the villa with whatever you want, but it’s a day’s travel to St. Barth from New York and by the time you reach the villa, finding your way around someone else’s kitchen is not what you want to do. Nick van Ee, Indonesian by birth but raised in Holland, stuck glasses of Champagne in our hands, turned out ultra-light shrimp tempura (his secret is coating the shrimp in rice flour and cooking it in Heineken left out for an hour “so it starts to ferment”), and then turned out “the real sate” and grilled mahi-mahi. Right now, Sibarth has a summer special on Ti Reve: $4,500 per month for stays of a month or more. That’s $150 a day. That’s amazing. Beach House: THD turned off the road to Colombier and steered the jeep into well-grooved tire tracks on a dirt road that seemed made for donkeys. Off the port side, there was a flock of chickens scrounging around a back yard. This is St. Barth? Then the gates to Beach House opened, THD pulled into a grassy forecourt, walked down the deck and around the corner and there was the tail end of Flamands Beach—the best on the island, according to many—and a timpani of breaking waves. Beach House (below; photo by Pierre Careau) is a box seat on the ocean. 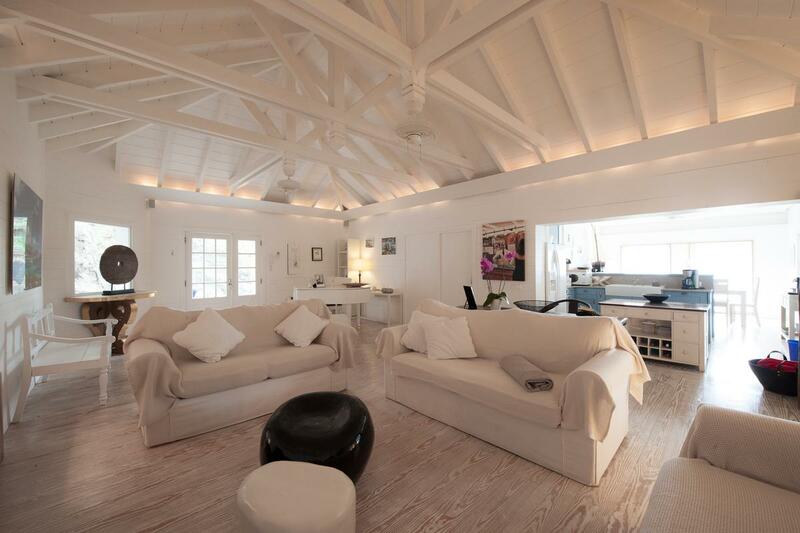 The two-bedroom custard-yellow villa is all white inside (below; photo by Pierre Careau)—THD felt like he was in Santa Monica. The deck, the table for 10, and the chaises are of weathered gray wood, as if they’ve been driftwood in a past life. Only the bedrooms are air conditioned, but the living room is peak-roofed and the onshore breeze and ceiling fans do just fine. And a great lunch is a flip-flop walk away: La Langouste, tucked away in the Hotel Baie des Anges, is one of THD’s favorite restaurants on the island. The price is $6,000 a week off-season, which comes to $500 a couple. That’s pretty good for a house on Flamands Beach. 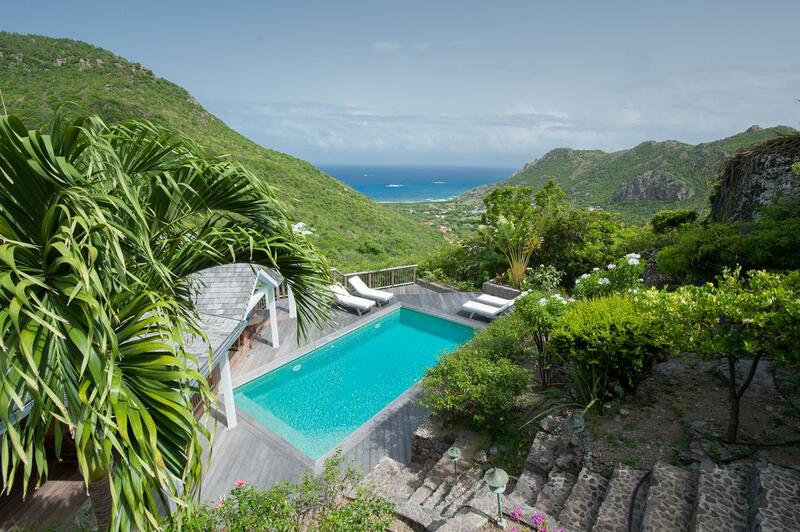 Kiara House: Vitet is the end-of-the-line on St. Barth, a clutch of houses high up on the east end of the island, but only 15 minutes from L’Orient . Still, the sense of isolation is palpable and activates your nesting hormones: Bring that Dickens or Tolstoy novel you’ve been meaning to read if you book here. Kiara House was built for a family and it feels like it. The two bedrooms are modest sized and right next to each other, but the bathrooms are spacious with walk-in, rain-head showers. It’s the public spaces though, that make this villa work. The wainscoting and the French country-style kitchen gives, as Sibarth’s website states, the house a Hamptons feel (below; photo by Abigail Leese), and the outdoor space (above; photo by Abigail Leese) is captivating. Your eye is tobogganed between two peaks, Morne de Grand Fond and Morne Vitet, and out over Anse de Grand Fonde and about a million acres of Caribbean Sea. Way over there is the silhouette of St. Maarten. Let’s say you went from July 2-9, so you could attend the annual July 4th White Party (not white tie, but white elegant). The cost would be $3,500, which comes to $250 a night per couple. For a million-dollar view. If THD were doing this trip again, he would ask to stay in Cap Plage, a one-bedroom bungalow steps from St. Jean beach. 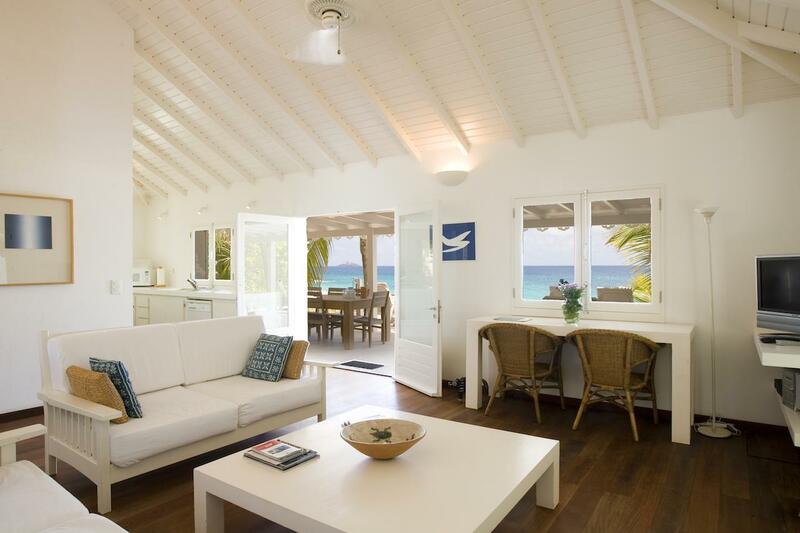 It’s dead simple, a one-room, central-casting Caribbean cottage with no Wi-Fi (test your disconnectivity quotient), and just a walk from St. Jean. The price? Less than $200 a night in summer and guess what? It’s already fully booked.